No birthday party is complete without a cake, and as June is Chocolate Goose’s 1st birthday, it seemed appropriate to bring out the big guns and celebrate with this deliciously smooth Chocolate Cake. 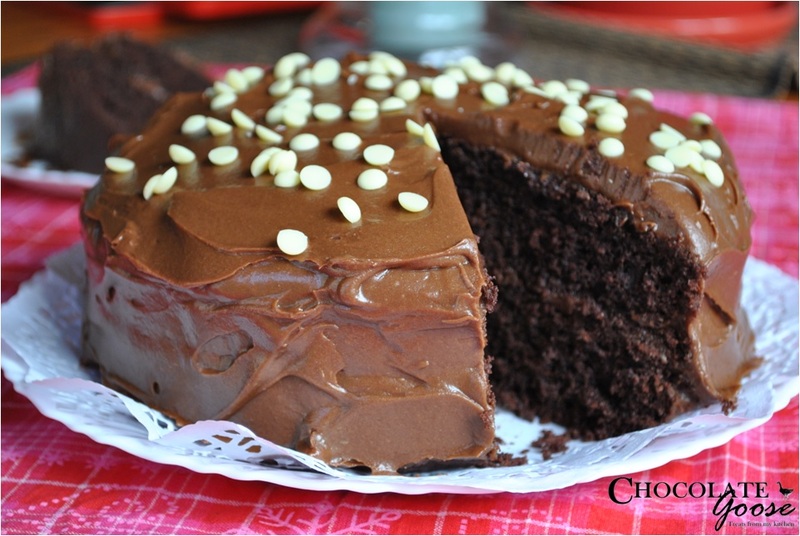 I have to admit, I was in a desperate chocolate mood and this recipe will soothe even the most ardent lover of Chocolate’s taste buds. I use the word “smoothe” to describe the taste which might seem a bit odd as one would normally use that word to describe texture, but somehow the sour cream ingredient balances the chocolatiness very well and combined with this particular icing, also containing sour cream, you can eat an enormous slice (or two) without the experience being overly chocolatey, rich or sweet. In fact, if I had to describe it in one word, I’d probably go so far as to say: Perfect! This is definitely one of my favourite Chocolate Cake recipes and isn’t a very fussy recipe, so is great for those who aren’t adept at creaming butter and sugar, or tend to overbeat mixtures. All ingredients can be thrown together in a food processor, in order of course, and if you end up with a fairly stiff batter that you really have to spread around the prepared baking tin, you’ve done it just right. If you don’t have a food processor, then sorry for you (and me) and will have to do the more traditional route of creaming the butter until very light in colour and texture, then adding the sugar and creaming a little more to combine the sugar crystals properly. Thereafter adding the eggs one at a time and beating well to incorporate, but taking care to not overbeat the mixture which will cause tunnels to form in the cooked cake and cause it to be harder. This cake should have a very light, fluffy look and feel. Depending on my level of chocolate desire at the time, and the age of the taste testers, I toy with the recipe and use either milk or dark chocolate, but ideally, a cocoa content of about 45 – 55% works well. And here I’m talking about the icing as there is only cocoa in the cake batter, so a dark Dutch processed cocoa not only delivers the perfect slice of heaven, but it has the beautiful dark colour too. I’ve also used a 60% cocoa content in this particular icing on a previous occasion and it makes it truly decadent, but can be a little “strong” for younger kiddies. The next time I serve this, I’ll probably add a dollop of freshly whipped cream to each serving too as it seems to sing out for it, but it isn’t necessary if you prefer not to. It’s just that I’ve had two “older” individuals, on separate occasions, comment that the cream would round it off nicely and as I’m very happy to take suggestions – and I happen to agree with this one – I think they’re right. Make sure all ingredients are at room temperature before you begin. Preheat the oven to 180°C and butter and line two 20 cm round cake tins. If using a food processor, add the flour, sugar, baking powder and bicarb, cocoa, butter, eggs, vanilla and sour cream and process until you have a smooth, thick batter. If you don’t have a food processor, cream the butter until light and fluffy, add the sugar and beat some more. Whisk the eggs in one at a time. Add the vanilla essence and sour cream and beat until just combined. In a separate bowl, sieve the flour, baking powder, cocoa and bicarb. Add to the wet mixture and gently mix together until combined. Spread the batter into the prepared baking tins and place in the centre of the oven. Bake for 25 – 30 minutes. Mine are always ready at the 25 minute mark, so please check with a clean skewer. If it comes out clean then the cakes are ready. Remove from the oven and allow to stand, in the tins, on a wire rack for about 10 minutes before turning them out of the tins to allow them to cool properly. Melt the chocolate and butter in the microwave or on the stove-top in a double boiler. Be careful as you don’t want to seize the chocolate as it will be ruined and you’ll have to throw it out and start again. Once melted and combined, set aside to cool for a few minutes. Sieve the icing sugar and set aside. Add the golden syrup to the cooled chocolate mixture (it doesn’t have to be cold, just not hot directly after melting), followed by the sour cream and vanilla extract. Whisk in the sieved icing sugar, adding a little (and I do mean “little”) hot water if necessary, until you have the perfect spreading consistency but if you add too much and it is too runny, just add a little more icing sugar. Spread a generous layer between the cooled cake tiers and stick them together. Lather the rest over the top and sides of the cake. I like to blob it on top and allow it to plop over the sides, but you need to work quickly to spread it around as it does begin to set. You can spend the time smoothing it out beautifully, but there is something to be said about the swirly textured look which is very enticing. Decorate with your preferred cake toppers, or leave it as it is. Today I opted for white chocolate drops. Receive posts direct to your Inbox?